For theatre technicians, riggers and stage workers in the entertainment industry who are required to work at height on fixed or temporary structures such as lattice structures, platforms and lighting rigs. Provides a range of skills for accessing and working on stage structures, including the use of all safety equipment, evacuation and rescue. Evacuation and rescue are practised at height. Candidates will be expected to work almost entirely from within the confines of protected areas but are able to move to exposed areas if necessary to carry out straightforward work tasks. 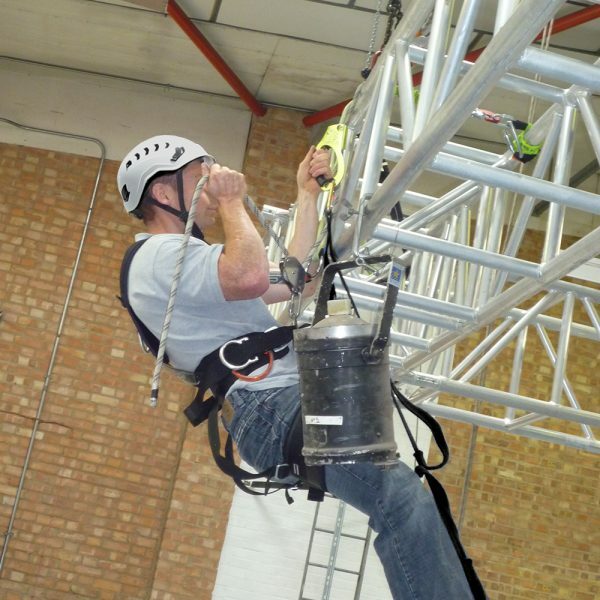 Our Work at Height in the Entertainment Industry course provides a range of skills for accessing and working at height on stage structures including the use of all safety equipment, evacuation and rescue. Legal requirements for working at height. Selection, care and maintenance of equipment. Climbing techniques, including basic progression along a theatre truss. Our theatre technician training course provides background knowledge for the working at height section of the PLASA National Rigging Certificate. This course is ideally suited to technicians, riggers and stage hands working in theatres,, consort halls or film sets and are required to work from lighting truss and other similar structures. This course requires a revalidation after three years. Please see Work at Height in the Entertainment Industry – Revalidation. Candidates are required to have an in date TTS9U certificate or, alternatively, both TFP4UE Use of Fall Protection Equipment and TRE2UE Rescue After a Fall certificates. Minimum age 18. Candidates should undertake a proper medical examination before undertaking work at height. Candidates should be comfortable with exposure to height. Must be fluent in English. The trainer will assess safety, competence and aptitude during practical work. Multiple choice written test with discussion.